As Christmas approaches, the KNOM air signal becomes bright and festive, heralding the birth of Our Lord with hymns and spots. At this darkest time of the Arctic year, western Alaskans enthusiastically celebrate Christmas for many weeks. We thank you most sincerely for helping us to call to mind the reason for all of the festivities. Thank you! May you enjoy a wonderful Christmas that is filled with God’s blessings. THERE’S A NEW ANGEL (left), and just in time for Christmas, as KNOM volunteers pose with the station’s 2004 Gabriel Radio Station of the Year Award. From left, Clinton White, Katie Ringenbach, Anna Dummer, Liz Recchia and Jenny Holtorf. At the awards ceremony in Los Angeles, program director Ric Schmidt thanked KNOM’s volunteers and permanent staff, as well as all of our benefactors and friends. KNOM is the only small station to receive the top radio Gabriel. Remarkably, we have been given it twelve times. HOW LOW CAN YOU GO? The week of December 21st, which is the shortest day of the year, the sun peeks above Nome’s frozen ocean for a brief 3 hours 54 minutes. At its highest, it’s so low to the horizon that a person five feet tall casts a shadow 322 feet long! AT PRESS TIME: In November, KNOM program director Ric Schmidt was elected president of the Alaska Broadcasters Association. Watch for a picture next month! CHRISTMAS INSPIRATIONAL SPOT: What does Jesus want at the crib? More donkeys? More shepherds? No, He wants you! CHRISTMAS INSPIRATIONAL SPOT: We give our love in boxes, wrapped, tied and tagged. But the first Christmas gift was a Love that needed no adornment or disguise, a Love that wrapped Itself around our hearts forever. GOLDEN (left): Former KNOM volunteer Emily Barrett holds two Goldie Awards she won at the Alaska Broadcasters Association’s annual convention in November. “Best Radio Public Service Announcement Series” honors a collection of educational spots featuring Alaska Native thoughts and concerns. 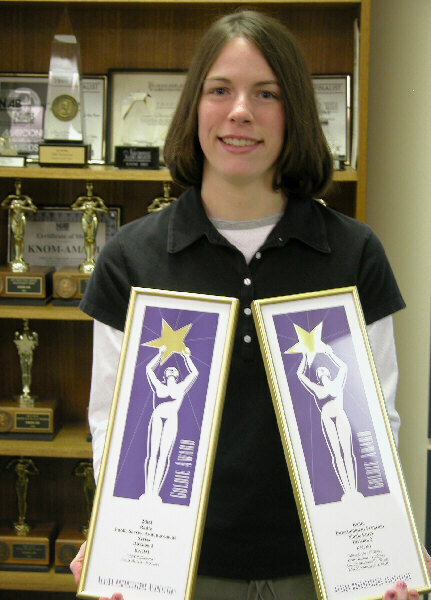 The other, “Best Radio Entertainment Program,” recognizes KNOM’s imaginative 2003 Christmas play, “Miracle on 35th Street,” which Emily also produced. This award also credits 2000-2002 volunteer Andrew McDonnell, who wrote the script while teaching at a college in Maine. This was the fourth McDonnell-penned Christmas program to win a Goldie. Andrew, who now lives in Saipan, has agreed to write KNOM’s 2004 Christmas play, and we can’t wait to see his script! KNOM was also awarded “Best Radio Web Site,” credited to general manager Tom Busch. Emily was a volunteer from 2002 to 2004. Today, she is employed as a children’s social worker in Nome. WHAT A MISS: Congratulations to 16-year-old Catherine Laurion of West Branch, MI. Catherine was recently crowned Miss Michigan Teen USA 2005. She is the daughter of Christopher and Christine Laurion, who were KNOM volunteers from 1982 to 1984. FAIR RESULTS: This autumn, Tom and Florence Busch spoke with over fifty students at Catholic colleges around the country. The pair were especially impressed by a handful of freshmen and sophomores who are already researching volunteer opportunities for after graduation. Here’s hoping that some of these young folks apply to be KNOM volunteers! KNOM is the oldest Catholic radio station in the United States � on the air thanks to you. CHRISTMAS INSPIRATIONAL SPOT: The gifts I hope you receive this year cannot be found beneath your tree. They are friendship, health, happiness, joy, peace, hope, and the guidance of prayer. Many of these gifts are around you right now. Can you see them? CHRISTMAS INSPIRATIONAL SPOT: Take a cup of kindness, mix it well with love. And you’ll have lots of angel food to feast on all the year. WHERE’S THE STREET? (left): October 19th, brutal winds pushed water on shore, raising the sea level 10-1/2 feet, with 10-foot swells, topped by immense breaking waves. 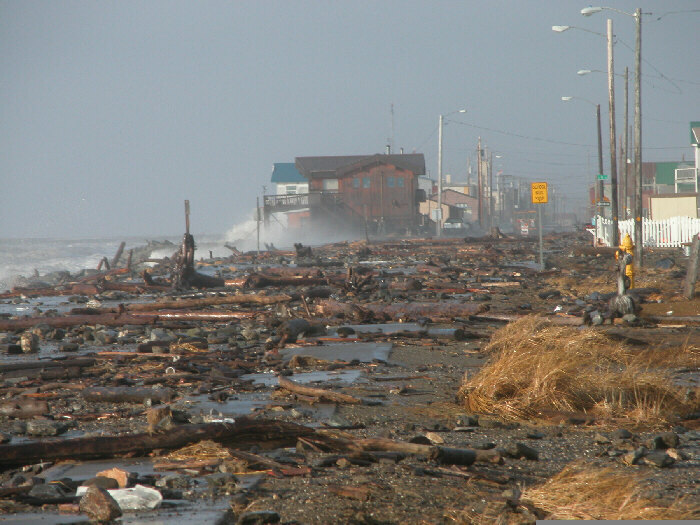 In this photo, you see Front Street after the ocean receded, littered with driftwood and rocks the size of watermelons. Power failed across much of Nome but thanks to our emergency generators, KNOM remained on the air with live continuous coverage, advising residents of evacuations, reporting on damage and urging people living on higher ground to remain safe by staying home and listening to KNOM for information. You would have been extremely proud of the KNOM crew. The storm abated sooner than forecast, and the town was spared what many had feared would be a full-scale disaster. TRANSLATOR NEWS: We had hoped to install at least a few of the 11 translator transmitters in remote villages before winter hit, but winter’s here. Further, the folks at AT&T, which will distribute our signal to these transmitters, tell us that arranging circuits will take some time. And so, we will map out a plan for installation of as many as we can during the short 2005 Alaskan construction season. Please stay tuned! Dear God, as the year’s end nears and nights are cold, we think about things that warm us, like quilts and blankets, each one made of many pieces, different colors, sizes and shapes all stitched together to form a thing of service and beauty. Lord, let us not forget that we, too, come in various colors, shapes and sizes, and by Your design, we, too, gain strength and beauty from this variety. Thank you, Lord, for all of our differences. CHRISTMAS INSPIRATIONAL SPOT: Let my arms be a manger, Lord, to serve the new born King. Let my heart be a shepherd’s fold where angels join to sing. Let my life be a traveling ground where Magi seek the Son. And most of all, let my heart be an open inn to welcome the Holy One. IN HIGH PLACES (left): Since 1971, a KNOM Christmas star has proclaimed Jesus’ birth from high above downtown Nome. 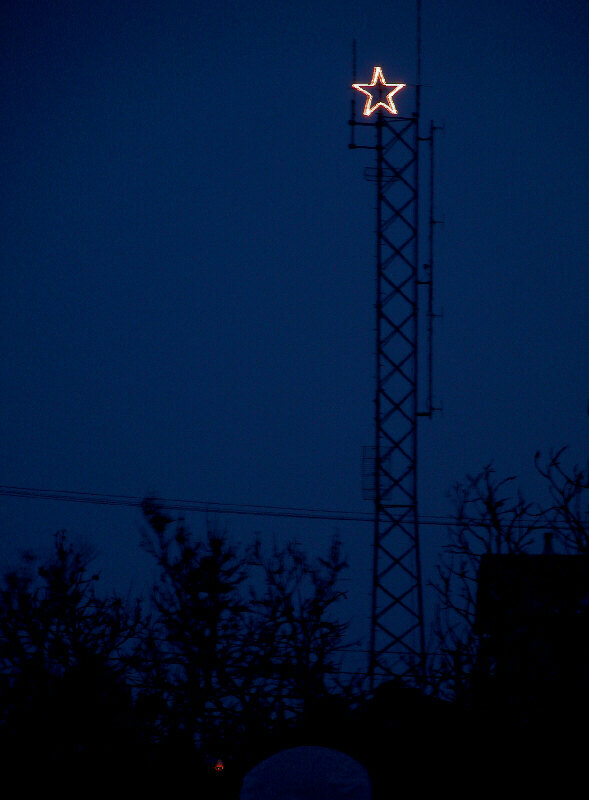 Illuminated from the day after Thanksgiving through the Epiphany, 2004’s star shines 85 feet from ground level, atop the mission’s studio tower. For many years, the electricity to light it has been paid for by an anonymous local contributor. THIRTY YEARS AGO: KNOM had always featured women’s voices on inspirational and education spots. All radio staff, however, were male. In December 1974, for the first time, the station added women, three of them, as scheduled deejays. In less than a year, almost half of the scheduled announcers were women. SPOT NEWS: By December 31st, KNOM will have broadcast a total of 34,000 inspirational spots during 2004, plus an equal number of educational ones. Thank you for making our work possible! APPLIED TOPICALLY: Recently over KNOM, we have continued to discuss a wide range of subjects such as cancer detection and treatment, underage drinking, fire prevention, Native teachers and employment, among many others. Educational spots addressed a wide range of topics, including food preparation, mammograms, winter safety, domestic violence treatment and prevention, prenatal health care and the responsibilities of citizenship. Again, we thank you for your prayers and your financial support. Our only source of income is the kindness of good people like you. We cannot thank you enough. On Christmas Day, as always, our heartfelt prayers will be for you and those you love. May your holiday season bring health, joy and the Peace of Christ. God bless you!